It's been a long time since 1, that I have created any watercolour art and 2, that I have done a post for Anna Brim, but yay, I can say that I am happy to be back doing both. I was so inspired by Anna's watercolour snowdrops video tutorial over on her patreon page - patreon.com/mrsbrimbles, that I decided to add my own twist to it using Colourcraft Crystal Colours Brusho as well as watercolour and stamping ink. I still used drawing gum to create a resist for the snowdrops. You can see my full process in the video below. Disclaimer: This post uses affiliate links, which means I may get a small commission if you purchase through these links. On the 2nd February this year I was fortunate enough to grab a ticket for the UKPA Big Meet and wow I'm so glad that I did. What an amazing event; a coming together of like-minded people, planners and creatives at the CEME Centre in Rainham, near London. If you only attend one planner meet up next year, then this should be the one, the golden halo of planner events (or should that be crown). Best of all Erin Condren was there, which means it is now the second time I have met her. Erin Condren style stickers in a Travelers Notebook. Please share me to Pinterest. Do you often struggle to find the right sticker kits for your planning, especially when using a travelers notebook? I have the solution; use a blank notebook. I love the freedom of a blank book and it means I can use any type of stickers, especially the lovely kits many of the shops make for the Erin Condren planners. Below I have two different layouts using EC sized kits, with a full chatty plan with me of how I put the layout together. ​This post uses affiliate links via Etsy, but they are all for shops that I love and recommend. Hard work does indeed reap rewards, I had a great year last year and wanted to incorporate working hard and rewarding myself into both my journaling and my Word of the Year for 2019. Last year I focused on the word 'Happy' and it was a great success. You can see more on last years word here Word of the Year 2018. Self Care is so important, if you don't look after yourself then you will struggle in other aspects of your life. 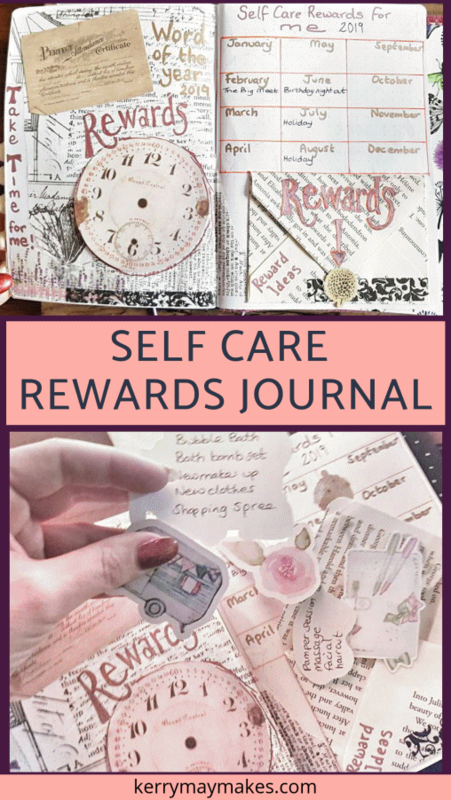 I love adding a bit of self love into my journaling as you can see from my self care and mood tracking journaling pages. Self Care and Mood Tracking ideas in your Bullet Journal. This years pages are an extension of this idea, but with the added notion of working hard to receive it. Yay, it's nearly Christmas. I love the first of December, I always feel so festive. Today I have filmed a flip through of my Christmas Planner set up for 2018 using an updated version of last year's planner. I also have some exciting Mini Christmas Journaling prompts for you to try out. 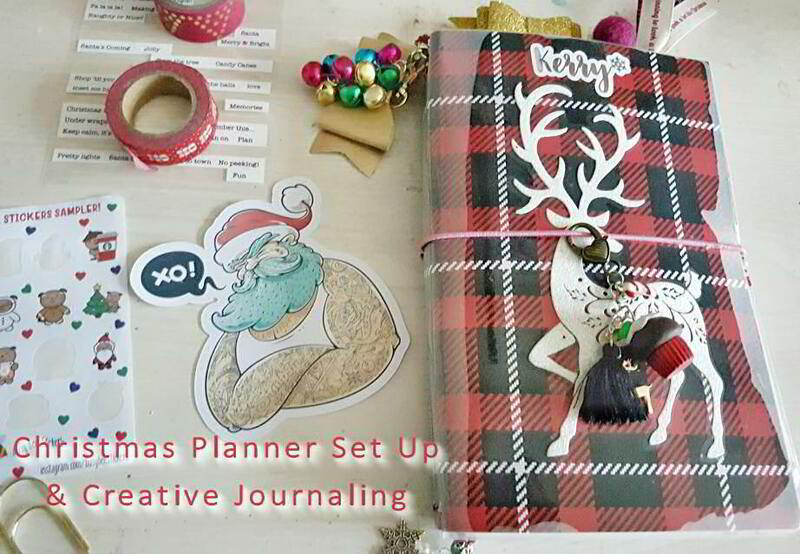 I will also be sharing some of my Christmas planner spreads and layouts from my planners so far this year. Finally I will show you in the video a bit of creative Christmas journaling and memory keeping as I won't be doing a December Daily this year ... phew! Disclaimer - This post description contains an affiliate link which means I may receive a small commission if you purchase through my link. 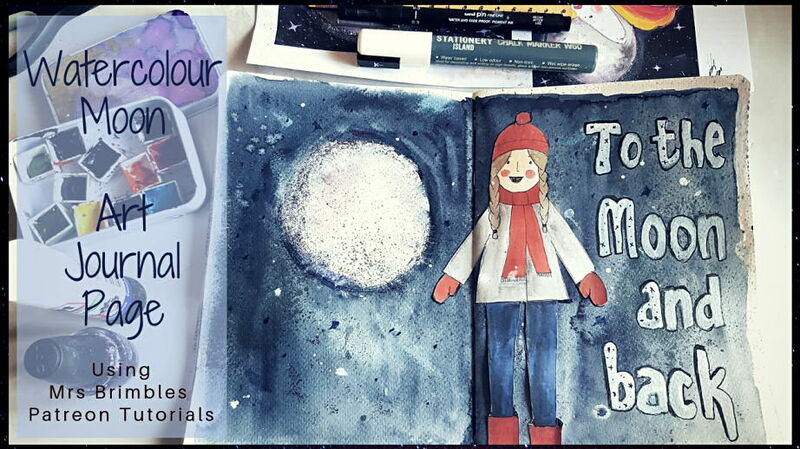 For this page I followed a video tutorial of Anna creating a moon page like this one, but with a painted unicorn... you can get this as a collage sheet and I tell you now, it's stunning (you can see a sneak of it below in the photograph). Bullet Journals are all the rage at the minute, if you haven't yet tried them then why not start now? I've compiled the perfect bullet journal resources guide to help you kick start your bujo planning. The resources would also make great gifts for a bullet journal or planner enthusiast and just in time for your Christmas shopping. Disclaimer - This post contains affiliate links which means I may receive a small commission if you purchase through my link. Read my full disclosures here. I love experimenting with my art and that also means experimenting with the medium and what I create my art work on. I am an avid journal lover (as you know), but I have also been playing around with creating art on canvas. This can seem daunting, but it needn't be, honestly it is so easy to create a beautiful piece of art on canvas. Read on for tips for beginners on getting started on creating your own art canvas. Hi all, wow I have been feeling so inspired from Anna Brim's latest patreon videos. This month has great content in both the videos and collage sheets that I had so many ideas for this blog post. I decided to take inspiration from a video she shared with her patrons about using post it notes and doodles. 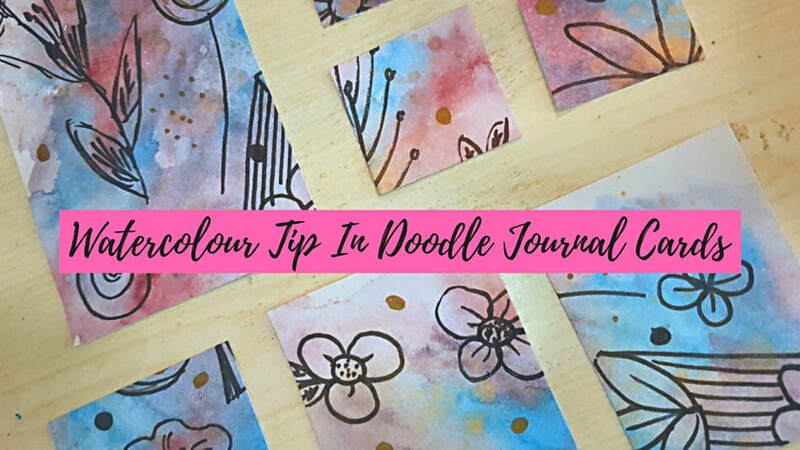 I decided to add my own spin to it and use a painted watercolour background using Daniel Smith half pans, then added doodles to that before cutting the whole page up to make a mixture of ATC Cards, Journal cards and post cards. You can see the whole process below. This post contains an affiliate link which means I may receive a small commission if you purchase through my link. Hi all, long time no see. I thought I would do a Plan With Me this week as I haven't done one forever and this kit is really singing to me. It's a stunner, a mermaid style planner kit from Hazy Days UK. You can grab a kit here, use code KERRY15 for 15% off a £10 spend or more and my free sampler sheet too. I'm not going to ramble on here, you can see the process in my full chatty video below.